If it’s on a screen, and worth watching, we’re all about it. Hmmm, I think what this episode needs is, oh yes, more death. We did get a dead dragon though, and now it’s an undead dragon (gulp). Limb-itless lost two characters in this episode, although both Thoros and Benjen had barely shown up in the show or even at all in Benjen’s case, so not too much of a loss there. Unless there’s a big shakeup in the finale tonight, I don’t see how Debt Payers loses this one. The Scorecard is below, with individual team scores after the jump. All it takes is a little dragonfire to make things a little more interesting. With both Randyll and Dickon burnt to a crisp, that brings Money For Nothing, Pod Free within striking distance of Debt Payers. Only two episodes left! Dany finally decided to use her dragons and in doing so brought about maybe the most instantaneous amount of death the show has seen in some time. Alas, there were no rostered characters who actually died, so no points for Money For Nothing, Pod For Free. 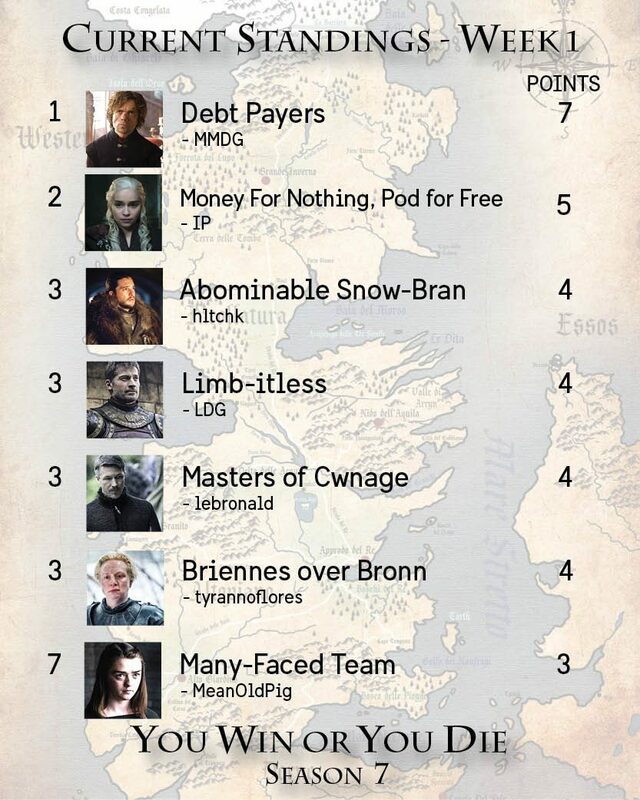 With only three episodes left, it’s going to require one of these teams to kill off Cersei or Euron in order to overtake the Debt Payers; a repeat championship might be on the horizon. Just when we we felt like we’d get all the way through another episode in this shortened season without a single death, Euron comes out of goddamn nowhere and kills not one, but TWO Sand Snakes! While this didn’t necessarily set the teams back who lost those characters, it was a nice little early boost in the standings for the reigning champ, who now holds a seven point lead over runners-up Abominable Snow-Bran and Money For Nothing, Pod For Free. It’s crazy to think there are only five episodes left in the season; things are definitely about to get weird. With only a few episodes left remaining in the entire series, I think most of us were expecting a little more action in the Season 7 premiere. Even though we didn’t see any early deaths, there were still plenty of appearances to make things intriguing. Everyone is on the board after Episode 1, with reigning champion The Debt Payers in first place and scoring a maximum seven points for having his entire team appear in the premiere. Money For Nothing, Pod For Free is in second with five points, with most of the league tied at four and Many-Faced Team not far behind with three points. The Scorecard is below with individual team scores after the jump. It’s been over a year since Season 6 concluded, and, finally, Game of Thrones is back. I feel like most of us could not be more anticipatory of the new season after developing and playing Fantasy Thrones. It made each episode viewing even more nerve-wracking. I, too, almost walked out of a window after Tommen, who was on my team, Abominable Snow-Bran, just gave up on us. Debt Payers‘ insane come-from-behind victory was the stuff of legends. We didn’t give out an MVC award (Most Valuable Character), but I have to believe it would’ve gone to Cersei. So yes, we are extremely hyped to start Season 7 and keep this ridiculous game going. This season, we decided to use a dynasty league format and allow teams to keep two players from their rosters from the previous season. Once everyone chose his or her keepers, the remaining characters were placed back in their respective groups, with a few new additions added to replace those who had died in Season 6. The draft order was determined by the number of points scored last season. Many-Faced Team scored the least amount of points, so he got the first pick in the draft, going with the consensus number one pick, Lyanna Mormont. A standard snake draft resumed until all teams rostered one character from each of the seven groups. All available characters and their respective groups are shown in the tables below. Characters in italics are new additions for season seven. The characters in bold were kept on their respective teams from last season. My love affair with the original Star Trek series began on the shag-carpeted floor of my grandparents’ house in the early 80’s, watching syndicated reruns with my uncles before family dinners. This being the 80’s, and me being an impressionable young grammar school nerd, I was acutely aware that Trek was dumb and old, and Star Wars was awesome. I also had an action figure-obsessed cousin who took every opportunity to convert the kitchen linoleum into the frozen surface of Hoth, all while ridiculing his dad’s scale model Enterprise. fancy a drink with Lt. Noel and Dr. Van Gelder? The passage of time has allowed me to appreciate Star Wars for the wild west space fantasy that it is (and, let’s face it, two good movies), while more fully embracing Gene Roddenberry’s vision of our future and the timeless relevance of his ever-expanding Star Trek universe. It all started with this show, in 1966. And now, years later, I’m able to watch these episodes in all their technicolor glory and recall the wide-eyed, partially terrified impressions from my youth. The melodrama, mystery, and mini-skirts. The iconic sound effects and styrofoam soundstages. I’m all in. It’s impossible for anything of this sort to fully withstand the test of time, and many moments have since crossed over into camp, but the sum is certainly greater than its parts. Having said that, of course, I’m going to pick five individual episodes that stand out. There are plenty of best-of and favorite episode lists out there, and narrowing down my own proved more difficult than I anticipated. I’m just glad I opted for The Original Series, because choosing just five episodes from the seven seasons of either The Next Generation or Deep Space Nine would probably be far more difficult. I’ll let my cohorts struggle with those choices (and then rudely comment on the ones they missed). The following episodes are listed in airdate order, not preference. This month, one of the world’s most beloved science fiction franchises is celebrating its 50th anniversary. On September 8th, 1966, NBC aired “The Man Trap” and audiences were introduced to Captain Kirk, Dr. Leonard “Bones” McCoy, and the rest of the crew on a five-year mission aboard the U.S.S. Enterprise. Gene Roddenberry’s Star Trek was immediately popular, and, despite only three initial seasons, soon developed a cult following during the years of syndication, since evolving into a pillar of popular culture as well as the preeminent sci-fi saga of our era (sorry, Star Wars fans). In the five decades since Star Trek premiered, Roddenberry’s vision of our future has expanded into six television series (with a seventh forthcoming), thirteen feature films, and hundreds of novels, comic books, and games, as well as countless fan-driven celebrations ranging from conventions to stage plays and drag shows. There are plenty of ways to get in on the anniversary action. Here are five of the items on my to-do list. J.J. Abrams and Justin Lin’s Star Trek: Beyond isn’t the only Trek movie in theaters this year (although it may be the only one worth springing for IMAX 3D). Adam Nimoy, son of Leonard Nimoy, started working with his father several years ago on a documentary that would explore the character for whom Leonard is universally recognized – the Enterprise’s first officer, Spock. When Leonard passed away last year, the film shifted focus slightly, and began to incorporate more biographical background on the man behind the pointy ears, including an incredible perspective on mid-century Hollywood. The resulting film, For the Love of Spock, is a touching tribute to Adam’s father, as well as a love letter from a planet of Trek fans to that most endearing of Roddenberry’s creations. I gotta say, in the realm of fantasy games and sports, season-ending injuries are one thing, but there’s nothing quite like seeing one of your top-scoring team members just give up and walk out of a window. Fantasy Thrones has been an incredibly fun way for us to engage with the show and we can’t wait to see how the last season pans out. While Tommen’s death wasn’t necessarily surprising (yet certainly hilarious, even I have to admit), Cersei’s plot to blow the Sept of Baelor back to the days of the First Men was not only one of the biggest moments in the series, it completely flipped the script on our game. In one episode, Cersei took out six rostered characters; the High Sparrow, Lancel Lannister, three members of the Tyrell family in Loras, Margaery and Mace, as well as her uncle Kevan Lannister. We all knew that the longer the show went on, the more kills would matter in the game. Debt Payers ended up absolutely crushing the field, with Cersei netting MMDG’s team a grand total of 52 points! In fact, Cersei herself scored 35 points over the course of the season, better than my entire team, which barely held on to second place after losing both Lancel and Tommen. The only team unaffected by Cersei’s wrath was Limb-itless, who had no characters die this week. The rest of the episode featured plenty of other non-death related highlights. Olenna Tyrell forging an alliance with the Martells with the help of Varys, Sam Tarly ultralight beaming in the library at Oldtown, and Arya feeding Walder a sou-Frey and avenging her family by introducing Needle to his throat (didn’t take death long to sneak in to that list, huh?). Fill Your Inbox With Pop Culture Propaganda!